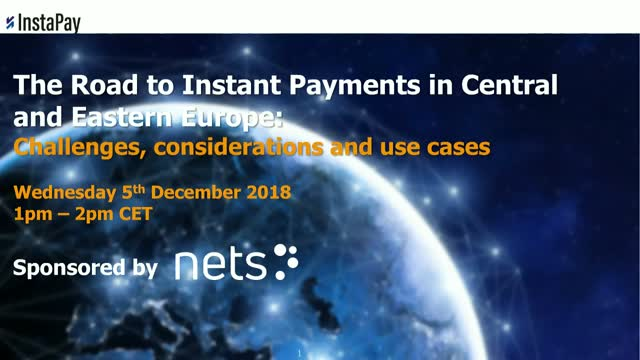 This webinar, sponsored by Nets, examines the adoption, challenges and use cases for instant payments in Central and Eastern Europe. Much has been discussed on the challenges involved with the adoption of instant payments – but there has been little discussion on how instant payments can enable banks to revolutionise their payments systems and spearhead payments transformation for the future. In 2019, the banking market will increasingly be distinguished between those who are innovators and those who are not. Payment transformation will be a pivotal point for those wanting to go further than glossy exteriors to lasting transform. Those that embrace the new open, data driven, and real-time world with technology models that match will lead the market. Those that continue to lean on legacy systems will become laggards and fall behind. This InstaPay webinar will explore how instant payments is an opportunity for banks to review their payments architecture, understand how to unburden themselves from legacy systems and compete in an evolving digital economy. The Federal Reserve recently requested public comment on a number of proposals. What does the Fed request for comment mean to the Financial Community and ultimately, to the end-user? This webinar is an opportunity to hear directly from the Fed on what is included in the request, an insight into the reaction of The Clearing House, as well as hearing the views of both a large and a mid-sized bank. As your institution is thinking through the strategic implications, take a listen to the experts and then form your own opinions. We also do encourage you to submit your comments to the Fed by the Dec 14th! The webinar will be moderated by Gene Neyer, Executive Advisor, Payments, at Icon Solutions. Gene’s extensive payments experience includes membership of the successor to the Fed Fast Payments Taskforce, GFFT, and President of the Supplier Committee at BAFT. Worldwide real-time payments (RTP) are already offering businesses and consumers speed, convenience and 24/7 availability. So what is the current state of RTP in the US? What are corporates expecting and how are early adopters finding the experience so far? With RTP development budgets and real-time cash positions cited as top priorities by US institutions, how is this translating into actions? This InstaPay webinar will explore some of the challenges in adopting instant payments in Germany and provide insights on how to prepare. Join this webinar to hear from different perspectives, from: Deutsche Bank, a bank at the forefront of instant payments adoption, the ECB and EBA Clearing on the attributes, reach and interoperability of TIPS and RT1, and from Icon Solutions, an instant payments implementer who will address the impact (if any) connectivity system choice will have on your technology approach for instant payments. How can Banks in Germany prepare for Instant Payments whilst controlling costs and managing risks? And what can we learn from those who have already travelled the path to Instant Payments? This InstaPay webinar will explore some of the challenges in adopting instant payments in Germany and provide insights on how to prepare. You will hear from three very different perspectives, global industry insights from consultants Accenture, real world experiences from UniCredit and Raiffeisen, early joiners of the RT1 scheme, and from Icon Solutions a leading global payments practitioner currently implementing real time solutions internationally. How prepared are organisations for SCT Inst and what are their reasons for participating, delaying – or even ignoring this initiative? In this special InstaPay webinar, you will hear from three very different perspectives - the view of a leading CSM, EBA Clearing, the view from a bank participating in SCT Inst, Caixabank, and from a practitioner committed to helping organisations adopt the scheme; Icon Solutions. - Why are leading banks planning to join SCT Inst? - Who will be the winners and losers of the SCT Inst service? - How quick will the rate of adoption be across Europe? - What are the routes to connecting to SCT Inst? - What can we learn from the experience of others? - What impact may the ECB TIPS announcements have? With over 25* installations already live around the world and 19 in the planning stage there can be no doubt that instant payments are a growing global phenomenon. Our Payments experts will share their insight, gained from organisations who have already transitioned to instant payments, and provide you with a practical and strategic approach to your implementation based on the recent Lipis Advisors’ Implementing Instant Payments: Insights from Early Adopters research. Register your place now to hear from our panel of experts who will show you that instant payments is a feasible proposition for everyone which does not require endless budgets and a massive headcount for successful implementation. The webinar is being moderated by Mark McMurtrie - Editor, InstaPay.Today with guest speakers Leo Lipis, CEO of Lipis Advisors and Tom Hay - Icon's Head of Payments. They have seen and heard just about everything when it comes to payments and instant payments implementations and will be happy to share their insights with you. If you are looking for the key insights from the latest PSD2 RTS then this webinar is for you. The European Banking Authority (EBA) recently published the long-awaited (and much debated) draft Regulatory Technical Standards (RTS) covering Strong Customer Authentication (SCA) and secure communication. In this special, exclusive webinar, Icon Solutions’ PSD2 experts, Tom Hay (Head of Payments) and Chris Kong (Senior Consultant and Co-chair of the ECB/ERPB PSD2 Identity subgroup) will share their interpretation of the standards and the key things you need to know to meet your PSD2 obligations and beyond. We run a series of webinars on topics relating to Instant Payments and PSD2. Our webinars are designed for all stakeholders within the payments industry.